RMPrepUSB portable allows the Windows user to easily and quickly ‘roll their own’ multiboot USB drive. It allows the user to quickly test, partition, format, install a boot manager, extract or copy files and then test a multiboot (aka multipass) USB bootable drive. It can also make or restore an image and much more. Multiboot ‘point-and-shoot’ utilities like YUMI or XBOOT are excellent, however they don’t support every different ISO or image. You will learn to enjoy making your own personal multiboot drive using RMPrepUSB! -Instead of using dd to copy an image to a drive (which can be risky if you choose the wrong drive!) use RMPrepUSB. -Fast – formatting is quick. A special FAT32 layout is used which improves write speeds to your USB drive by as much as 10% or more. 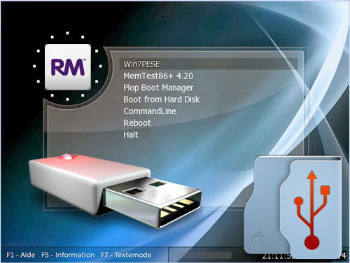 -Flexible – you can install a variety of different bootloaders and perform all the actions normally required to make a bootable USB drive within RMPrepUSB. -Test Environment – you can test that your USB drive boots using QEMU before you try boot it from a real system. Image your USB flash memory pen – RMPrepUSB can take an image of you entire flash memory pen drive and then restore it later. You can keep lots of different bootable images on your Windows hard disk and restore them to your pen drive at a later date. You can also save the contents of just one or several sectors (e.g. the MBR) to a file and restore it later. Information – Use the FileInfo or USBInfo buttons to get information about an image file or USB partition. Use RMPartUSB in your scripts – RMPrepUSB is just a front-end user interface for RMPartUSB which is the command line utility that does all the hard work. The command line is displayed to the user by RMPrepUSB just before it calls RMPartUSB, so all you need to do is include the same command in your scripts. One use for RMPartUSB is just to detect if any USB storage device is connected and find out which physical drive number and volume letter it has been assigned by Windows. See RMPartUSB.txt for more info or just type RMPartUSB in a command console window.